An Opening for Greek Society? Antonis Samaras, the Greek prime minister, vied for votes in last year’s elections by embracing the criminalization of undocumented immigrants and adopting the racist rhetoric of the neo-Nazi Golden Dawn party. In the run-up to that election, he approved “Operation Clean Center” (Katharo Kentro), which led to the mass arrests of immigrants in Athens. (Is it really necessary to explain why the use of the word, “clean,” is racist?) During his most recent term in office, Samaras has pursued more mass arrests and the expansion of immigrant detention camps. At the same time, Golden Dawn’s violence — the murder and systematic assault of immigrants and Greek anti-racism activists — has reached record levels. The violence was commonly known to all it seems, except the government and its police force. Until now. On Saturday, September 28, 2013, Samaras turned the Greek justice system against Golden Dawn, arresting its leader, some twent other fascist goons, as well as a police officer who is suspected of collaborating with Golden Dawn. But the complicity of Samaras and his government in fueling racism and tolerating violence seems to have had no consequences. 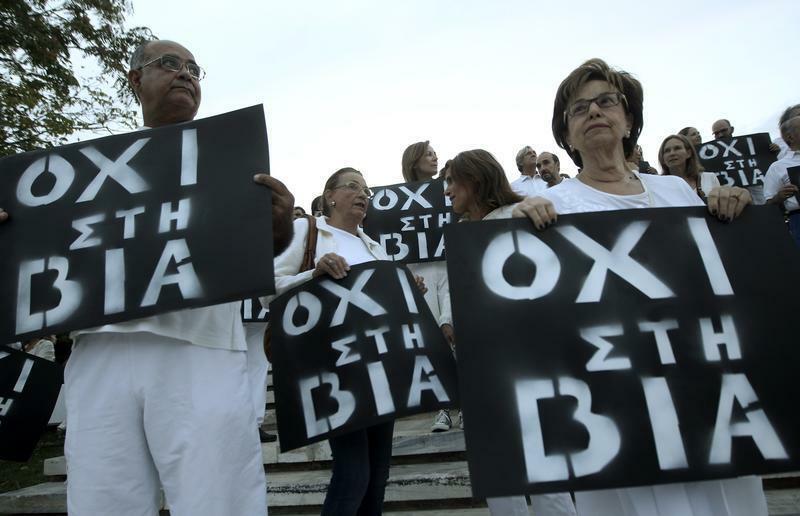 Samaras is not alone among Greek heads of state to criminalize and persecute non-Greeks. The criminalization of immigration and the racist treatment of poor non-Greeks in the society at large dates back to at least 1989. (See FACING ATHENS, which was published in 2004.) Ordinary Greeks, too, bear much responsibility for demonizing immigrants, while tolerating the kleptocracy that has governed Greece over the last thirty years. Before yesterday’s arrests, Golden Dawn would boast of having a million supporters in a country of 12 million people. It’s too early to tell, but perhaps the arrests yesterday will mark an opening in Greek society, to make racism (and other forms of discrimination and violence) a central social issue and to strengthen the rule of law. Greece will not prosper otherwise. Facing Athens again — capital of Greece: All Time Classic. Since the Greek catastrophe began four years ago*, its cause has changed in the public discourse every few months. Each of these supposed causes has seemed credible, at least for a time, as each has become known to us in the pages of distinguished media or from the mouths of political leaders. Yet the fundamental reason for the wrecking of Greece remains largely unspoken. Vanquishing any and all of these enemies promised, at one time or another, some fantastic return to a pre-catastrophe idyll — to the summer sun, bouzoukia, nepotism, materialism, class and racial inequality, and environmental destruction. All of which would be just fine for those who receive little attention as ordinary people do battle with themselves and with their impotent government. These are the oligarchs — a mix of old but mostly new money — whose fortunes ballooned as compliant politicians helped them transfer public wealth into offshore accounts. These are the same people who control the country’s news media, soccer clubs, oil refining, construction, real estate, and of course banking. For them, any enemy will do. *In reality, the catastrophe began much earlier, as I suggested in a book I published back in 2004. Watch a video by InfoWar Productions about the insidious connections between the Greek police and the fascists of Golden Dawn. And check out the other videos, radio shows, and reportage on http://infowarproductions.com/. InfoWar, along with the magazines, HOTDOC and UNFOLLOW, are doing hard hitting, investigative, high-quality reporting, which has been rare in Greece. Both the government and the plutocracy have noticed. Kostas Vaxevanis, the editor of HOTDOC,was briefly detained for publishing a list of purported tax evaders. In a separate incident, Eleftherios Charalampopoulos, a journalist of UNFOLLOW received death threats for implicating a Greek tycoon in the contraband trade of oil in Greece. In the Greek morass, this type of journalism tells me that there is still hope for democracy and justice in the country. It was startling and sickening when Golden Dawn, the Greek neo-Nazi gang, took nearly seven percent of the vote in May’s national elections. Immediately afterwards, Golden Dawn flashed its violent and authoritarian ways by setting an appalling rule for its press conferences: journalists had to stand as the gang leader entered the room, or they would be kicked out. Excuses and wishful thinking followed, as Greeks sought to come to terms with the thugs who now commanded 21 seats in parliament: people had voted out of anger, without really understanding what Golden Dawn was; or voters were just looking to shake things up; or Golden Dawn’s vote count would drop in the next election as people would come to their senses. Days before the elections on June 17, Golden Dawn grabbed the headlines again. During a televised political discussion, one of the gang’s lieutenants, a skinhead, turned on two female parliamentary candidates of the Communist Party of Greece (KKE). The skinhead tossed water from his glass on the first and slapped the second several times. That was surely the end. People saw Golden Dawn for what it really was. Political leaders condemned the incident. (Yet the leader of the center-right party, who ultimately became prime minister, included an anti-immigrant plank in his platform that was little different from Golden Dawn’s position.) As it turned out, the incident had no effect. There has even been speculation that the violence reversed the decline in support for Golden Dawn. Ultimately, the neo-Nazis garnered just 15,000 fewer votes in the June elections, a decrease of 0.05% of the vote. Some eighteen of their gangsters entered parliament earlier this week. No incidents of violence have been reported in the chamber yet. Greece, a good friend in Athens recently declared, doesn’t have an economic problem, but a cultural one (politismiko provlima). Indeed, the abuses of power, corruption, and materialism that bankrupted the country were primarily social failures, not fiscal blunders. In my first blog entry two years ago, I wrote optimistically about the possibility of crisis leading to renewal, of Greeks embracing not only a new economic model, but a new social order that cultivated civil society. Since then, there have been some encouraging signs: the creation of a barter system; a modest back to the land movement; and the wide participation of people in protests against austerity. The recent elections, too, held some promise of a new start. The electoral gains of the neonazis, of course, are a big exception. Still, the proliferation of smaller parties on the left and the right, and the electoral collapse of the two parties — PASOK and New Democracy — that had exchanged power for nearly four decades suggested a reordering of Greek politics. But as Greece prepares to return to the polls on June 17 — the previous elections did not yield a clear winner — the political discourse has regressed by some thirty years. The two leading candidates, a conservative and a leftist, are using extreme language and innuendo to attack one another. For Antonis Samaras of the conservative New Democracy party, his rival, Alexis Tsipras of SYRIZA is “dangerous” and “naive,” someone intent on “wrecking” the country. I’m reminded of Andreas Papandreou, the legendary socialist leader, who in the 1980s would suggest that a vote for the right was tantamount to supporting dictatorship. 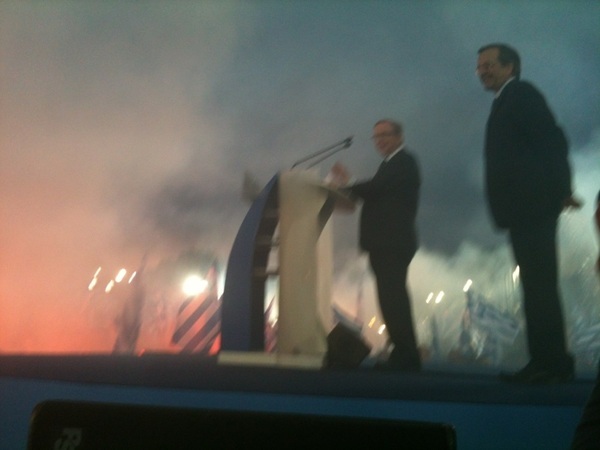 Greek media have played along, reverting to their habits of covering elections as if they were a rowdy soccer match. Rather than an opportunity to debate the fundamental issues facing the country, the election is reduced to a battle of two personalities, whose supporters endow them with all of their hopes and aspirations. As if this social crisis will be solved by a single politician, or a single political party. It’s this kind of paternalistic thinking that had created and protected a corrupt political class and that made cronyism a way of life in Greece. Greece, where I was born and from which I emigrated when I was 10, is a country driven to crisis by the dominant forces of our time: war, poverty and the globalized economy. On Greek ground, these external forces sow immigrant ghettos and racism, corruption, environmental degradation, and now near economic collapse. Turn to this blog for an exploration of these ideas, informed by my own immigrant experience in the United States. See also www.facingathens.com.